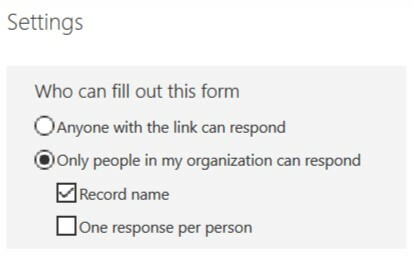 Microsoft Forms allows users to create custom forms and surveys which can be used to collect data from a group of people. Forms can be open to anyone, or can be set so that only people with an Oxford SSO can respond to them. To access Forms, sign into the Nexus 365 portal via https://portal.office.com – you’ll need to enter your University email address (e.g. firstname.lastname@bnc.ox.ac.uk) and will then be directed to the familiar Webauth login screen where you should enter your SSO credentials – the same as you use to log into your University email account. The Forms homepage shows a view of any previously created forms, plus buttons allowing you to create a new form or quiz. Forms and quizzes are very similar, but quizzes will allow you to provide feedback to any answers submitted and allows you to allocate a score value to each question. This guide will cover forms only, but if you would like a guide on how to create a quiz please contact computer.office@bnc.ox.ac.uk and we’ll be happy to add one. Click the New Form button and you’ll be taken to the form design view. To begin with there is only a title – if you hover over this you’ll see the area is highlighted in grey. Most of the text labels in modules added to your form can be customised – just click on the text to change it and then click anywhere outside the main body of the form to exit edit mode. Note that the form will be saved as you work on it, so you can always leave the page and come back to it if you need to. Click anywhere within the highlighted area to edit the name of the form. Here you can also enter a description if you wish to provide more details about the form. Once you’re happy with the title and description, click the Add question button to begin adding questions. Allows you to present respondents with a choice of predefined values – this can be set to only accept one of the listed options, or as many options as the respondent likes. You can add as many options as you like, plus an “other” box to allow respondents to type their own answer if appropriate. You can also toggle the Multiple answers slider to allow respondents to choose more than one of the options in the list – by default they can only select one answer. Rating questions allow respondents to give a numerical or star rating to something. You can choose how many levels the rating should have – by default the rating is out of 5 but this can be changed to anything between 2 and 10. This can be used to ask respondents to submit a date in response to a question. Use this when you want to ask respondents to rank a group of options in order of importance or preference. This is another type of scale that can be used to ask respondents to rate how much or how little they agree with a given statement. To customise this you simply need to add the statements you wish people to rate their attitudes against, and along the top specify the scale on which you want people to grade the statements. You can add as many statements here as you like (click Add statement to add another) and you can also increase the number of options on the grading scale using the + symbol to the right of the grading options. To delete an option, click on its text and then click the delete icon that appears. Allows respondents to rate something out of 10 on a scale – for example you may wish to ask somebody the likelihood of them doing something. Once again, you can change the labels at either end of the scale depending on context. Once you have created your questions you may wish to reorder them, delete them or copy an existing question to create one that’s similar. Left to right, these icons mean copy, delete, move up and move down – fairly self-explanatory! Click the Preview button in the top right-hand corner of the screen to see a preview of your form as it will look to respondents. You can toggle between Computer and Mobile views to see how the form will appear on both computers and mobile devices. You’ll then see a few options including Branching and Settings. For some forms, you may need to direct respondents to certain questions depending on the answers they provide earlier in the form. The Branching menu allows you to configure the form so you can force users to fill out a particular question if they give a particular answer. Simply click on the question you wish to configure and you’ll see a dropdown menu labelled Go to – this allows you to select which question should be answered next. The settings menu allows you to configure who can access the form as well as set a start/end date for accepting responses and any notifications. The first part of the settings menu allows you to configure who can fill out your form. By default, forms are set so that only people in my organisation can respond – this means that anybody who receives the link to the form will need to log in with their Oxford SSO (e.g. bras****) in order to fill it out. If the form is set to force people to log in, you can set it so that each person can only respond once. If you want the form to be anonymous but still restricted to Oxford users only, you’ll need to make sure record name is not ticked. If you want the form to be open to anyone regardless of whether or not they have an SSO, select Anyone with the link can respond. 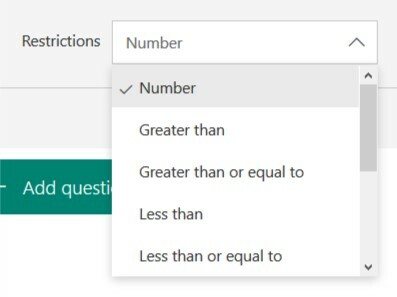 Note that if you use this option but still want to collect names, contact details etc, you’ll need to create questions on your form to collect this data. 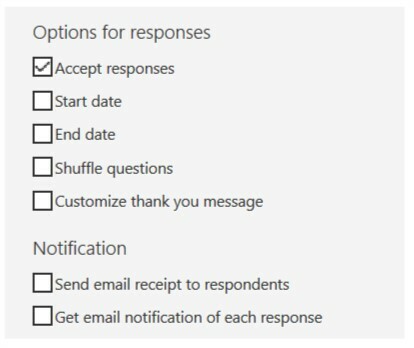 The bottom half of the settings menu has options for customising the start and end date for accepting responses, shuffling the questions (i.e. present them in a random order each time), customising a thank you message and setting options for notifications both for yourself and for respondents. If you wish to deactivate your form but keep it for later use, you can untick the Accept responses box to disable the form. You’ll need to tick it again when you want people to be able to fill in the form. Click the Share button in the top right-hand corner of the screen to access sharing options. This is where you’ll find ways of sharing the form with respondents. Under Send and collect responses you can click the circular icons (see screenshot below) to view different sharing methods. You can copy a direct link to the form, create a QR code for people to scan on their mobile, embed the form in a web page or create an email with the link in to send out. Please note: if sending out to a group of people via email we strongly advise that you put email addresses in the BCC field so that recipients of the email cannot see everyone else’s email address. Share the form as a template – you can send this link to someone so they can use your form as a template for their own forms. 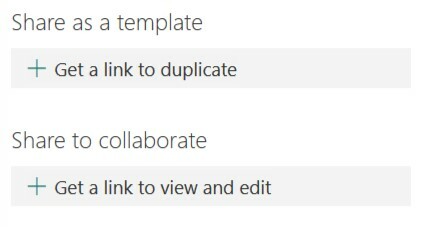 Share to collaborate – send this to a colleague to let them collaborate on the form with you. 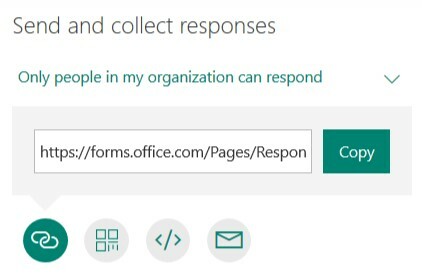 When you have received at least one response to your form, you’ll be able to see the number of responses on the Responses tab at the top of the form. 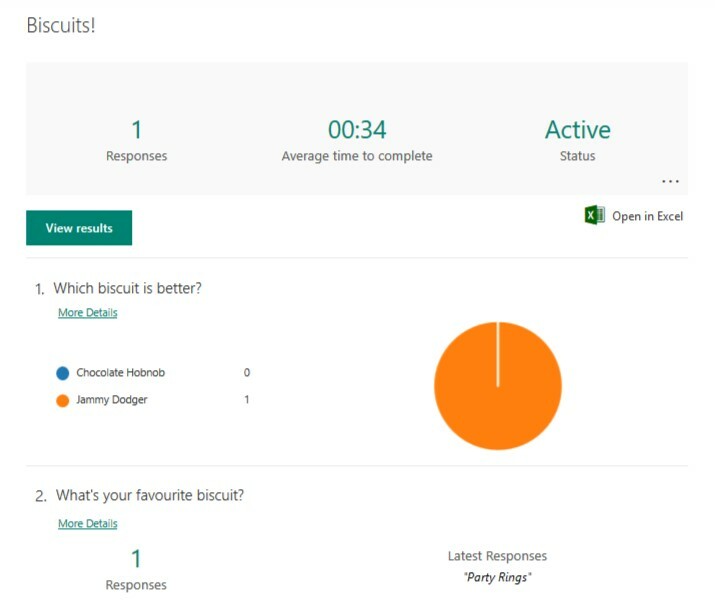 The Responses tab will show stats relating to the responses you have received and other useful information. You can click View results to tab through each respondent’s submitted form, and you can click Open in Excel to export your results as a spreadsheet. These stats are updated instantly whenever somebody submits the form. Remember that you can use the Settings menu to set up an email notification for each time you receive a response, so you don’t have to keep going back to the form and checking manually.